Petersburg is a small town with a big heart and rich history. It was surveyed by Abraham Lincoln in 1835 and has been a special place of neighbors helping neighbors and building community ever since. 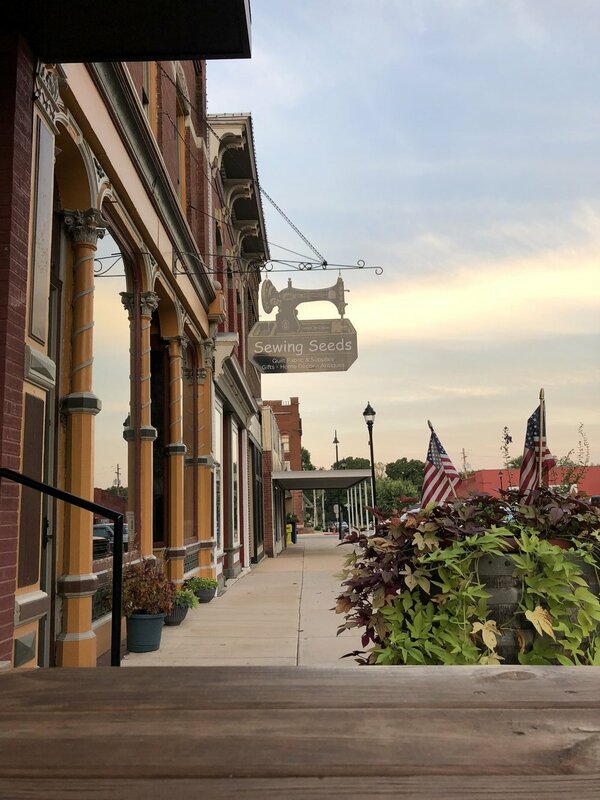 The Loft fits right in with that tradition and hopes you enjoy getting to know (or reacquainting) yourself with the charms of this special town. 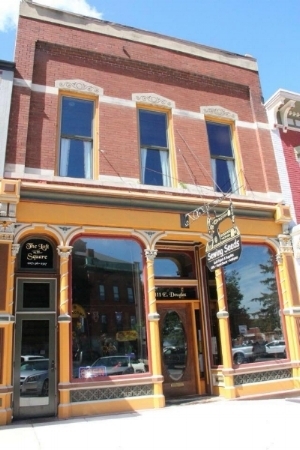 The Loft on the Square is located on the second floor of an old 1800’s building that has housed many things over the years. It currently houses Sewing Seeds on the first floor, a community spot for shopping and quilting. Historically, the upstairs of the building has been everything from a Judge’s office to the space used by the old-time switchboard operators. The space was left largely untouched serving as storage area for the last 30 years of its life until it was renovated as a place to stay when the Hand of Fate (“HOF”) Brewery was conceived of for the building next door. The HOF and The Loft rehab is really a testament to the local ingenuity of Steve & Ann Ozella’s construction talent, Pete & Judy Olesen’s vision and architectural know-how. Matt & Holly (Holly is a Petersburg native) are the lucky owners of the two buildings. The fates were even more at work since Holly’s Dad, Harry Wilson, built the current HOF building when two old historic buildings were torn down in the 1970’s. We warned you, Petersburg is a place with lasting community roots and lots of stories. We are very proud of our neighbor, Hand of Fate (and now DR.UGS Cafe) as they have drawn a lot of new faces to Petersburg, while giving locales a place to hangout and enjoy some of the best craft beer and food in the State. 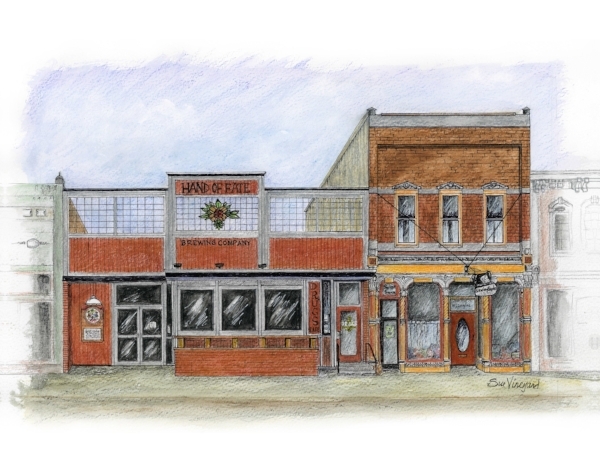 During the rehab of HOF and The Loft countless community folks shared their time, talent and treasures on a project many hoped would be a part of the revitalization of the downtown Square of Petersburg. We couldn’t be more grateful for their hard work, materials and belief in the future. You can’t really beat the craft beers that Mike & Brie have on tap, nor the tasty meals Jessica, Adam & Cindy serve at DR.UGS Cafe. We are biased, of course, but we can back-up our claim since the Hand of Fate won the state-wide competition to create and brew the Illinois Bicentennial craft beer. So, don’t forget to taste 1818 Prairie State Farmhouse Ale while you are in town and ask any of the locales how the competition worked and what their favorite beer is on tap or their favorite meal. We are a friendly community and love to tell others our story. We hope you love The Loft and Petersburg. Please enjoy your exploration of our small corner of the world and we hope you create some lasting memories. Enjoy outdoor dining street side or in the NEW cozy beer garden behind Hand of Fate & Dr. Ugs.